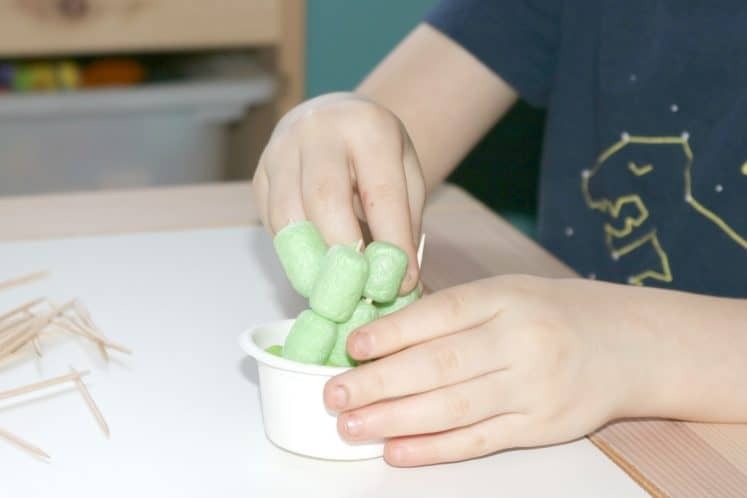 Preschoolers love exploring the world around them and this post is full of inspiration for doing exactly that, so if you’re looking for quick and easy preschool cactus crafts and activities, then you’re definitely going to want to check out this post. 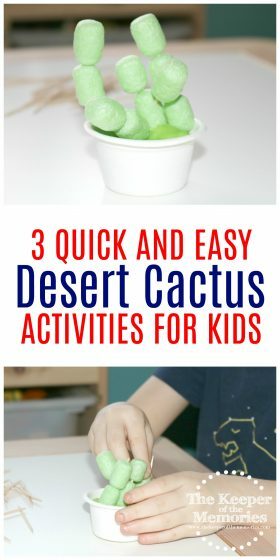 You’ll find fun cactus ideas for Math, Science, and of course Art that are perfect to do with your little kids during your next desert theme. We’re getting ready to wrap up our desert theme and I thought it’d be lots of fun to share an entire day with you. This week, we focused on the Mojave Desert and today’s topic was definitely all kinds of awesome! 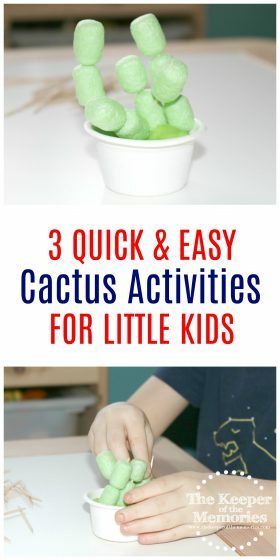 We learned about cactuses and did three quick & easy cactus crafts and activities for preschoolers. Cactuses are plants that usually live in desert climates. Cactuses can store water for long periods of time and have sharp spines/thorns and thick skin to protect them from animals. We also got our brand new Bees & Butterflies preschool curriculum kit and took a quick sneak peak. The little guy and I are totally excited to get started with it next week. I especially love the yellow and back pattern blocks. So fun! I explained to the little guy that cacti can hold water in their stems. And we talked about cactus safety too! What kinds of things are sharp or pokey? Explain that the spines of a cactus are sharp and help protect it from animals who want to get liquid from inside. First things first, we did this awesome Cactus Towers Investigation Station. Sometimes we have to improvise and today was definitely one of those days. 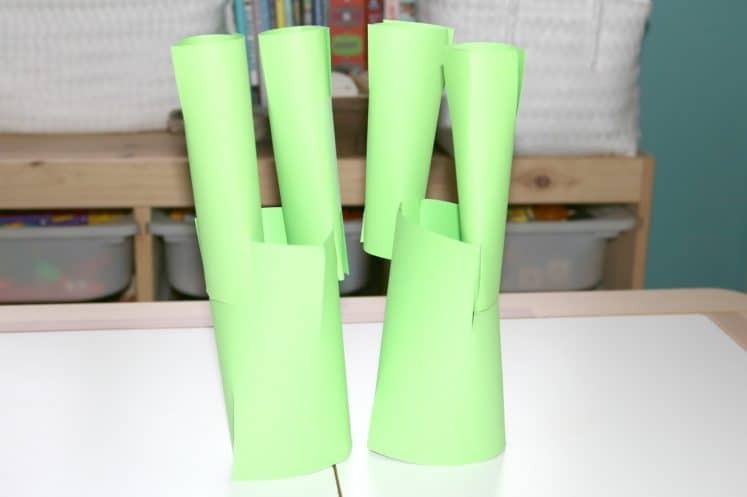 We didn’t have any cardboard tubes, so I used a piece of cardstock to make my own. Spray paint them green if desired. Cut slits on the top and bottom of the tubes. 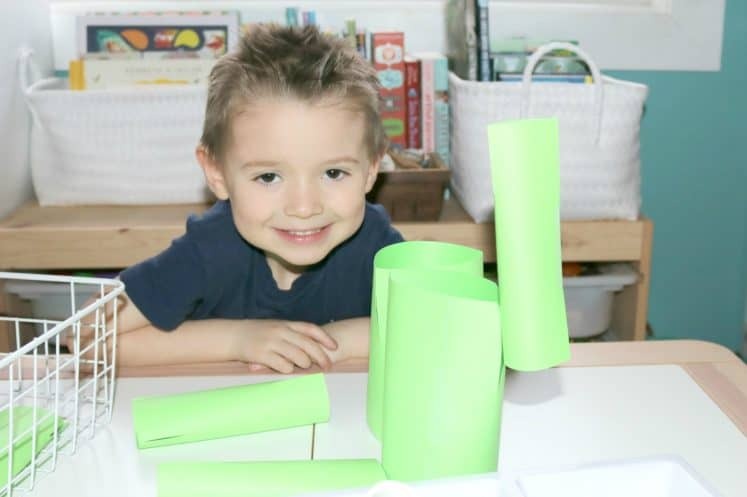 Encourage children to construct their own cactus tower by fitting the tubes in the slits. Make a couple examples and take a photo of them for children to observe if desired. Do all cactuses look the same? How might you make a sturdy cactus? 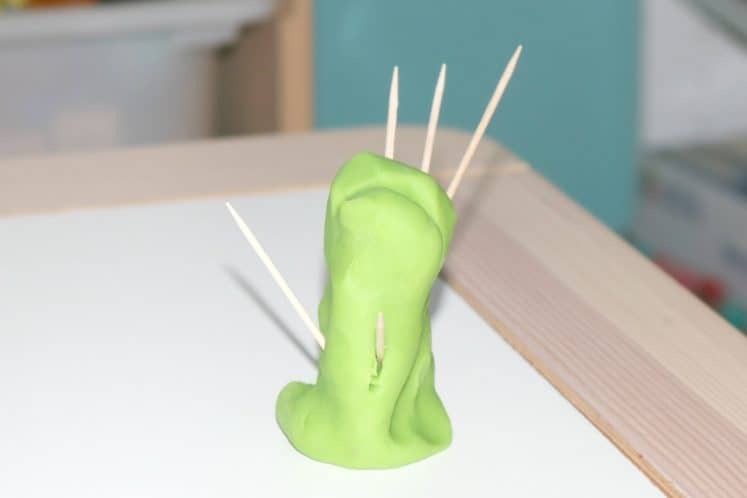 Next on our agenda was a Cactus Sculpture Make & Play. Cornstarch noodles are something that the little guy has totally seen before and because of that he didn’t need any introduction to how they stick together or what to do with them. How can you stand and look like a cactus? Give each child a souffle cup and invite him to decorate it to resemble a pot. 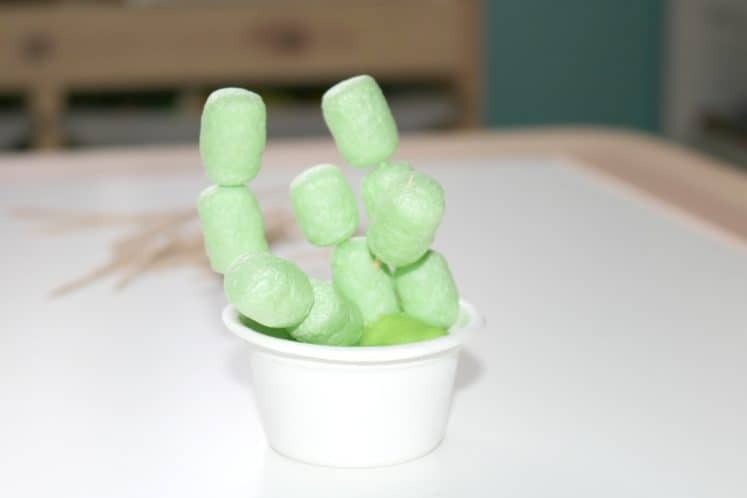 Encourage children to gently press a noodle to the damp cloth and then stick it to another noodle to create a cactus sculpture. Invite children to create a desert scene in the sand tub with their cactuses, nature items, and animal figurines. Did the child problem-solve how to make the noodles stick together and stand up in the planter? What different ideas did he try? And finally, we did a fun Pokey Playdough Small Group Math Activity. Usually when it’s just the two of us, we do activities like this verbally. Instead of using number cards, we talked it out. The ability to make things work for us is exactly why I love homeschooling so much. How many spines do you think are on a cactus? Set out toothpicks and playdough. Observe as children count and stick the “spines” in the dough. 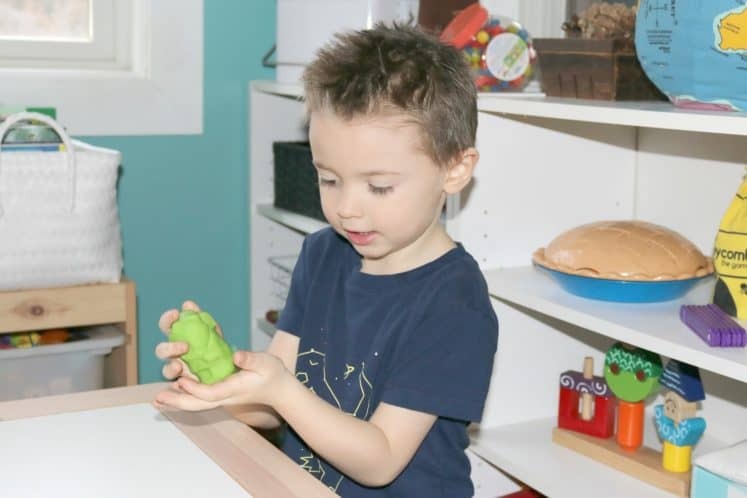 Make a large playdough cactus. Put number cards 1-10 facedown next to the playdough and toothpicks. Encourage a child to draw a card and identify the number, then stick that many “spines” in the cactus. Did the child identify the number on the card? Did he count out the same amount of toothpicks? There was also a Table Top Literacy Activity as well as a Suggested Story for the day, but we skipped them so that we had time for some other things that we’ve been working on. I try really hard to limit the amount of time that we’re spending on schoolwork at the little guy’s age. While I love this curriculum specifically because it’s play-based, I still want unstructured play to be the most important part of his day.